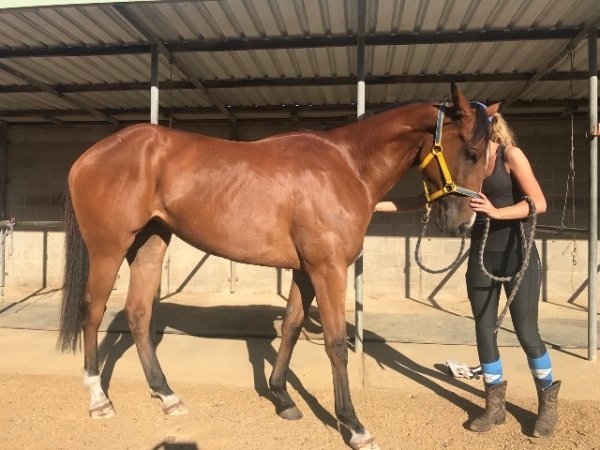 An opportunity to join in to a filly bred jointly by Trainer and a few select owners whom raced the Dam and saw potential with progeny given the right stallion combination. To be trained by Jackson Pallot at Bairnsdale, he trained mum for us whom we purchased as a tried horse out of Sydney. Her race record certainly showed that she could gallop, she won 5 races, ran 2nd and 3rd in Sydney at Saturday level and 4th at Sandown when with us, she also won brilliantly first up after doing a tendon and as a 3yo ran a creditable 10th in QLD Oaks beaten about 5 lengths. Filly has been broken by Bryan Maher and has had all education preparation including a light trial and spell. She will be coming back shortly for new prep and hopefully commence a strong racing career. This filly is the second runner for Dam Pooties. The first, Gelding, Alabama Man (Sire Americain) also trained by joint owner/Trainer Jackson Pallot from Bairnsdale had his first prep this year and whilst we saw this prep purely as an educational prep for a horse as he was immature and far from being at peak physical condition he managed a Strong win at Sale and 3 places in strong maiden fields. His closing speed surprised us all and we are confident his next prep will be even better as he improves physically and mentally. Dam comes from the highly successful Danehill Dancer Line. This filly is described by Breaker & Trainer as a better type than brother Alabama Man and was further forward at the same age. I am selling a percentage of my ownership basically at the cost of getting filly up to Racing commencement. I will be retaining a percentage as I believe we have a potentially good runner. She is Super Vobis & Gold Vobis nominated. HOST (CHI) (Chestnut 2000-Stud 2008). 10 wins-3 at 2, Keeneland Turf Mile S., Gr.1. Sire of 198 rnrs, 105 wnrs, inc. SW Philippi - Vanilla (H.K.) (MVRC Alister Clark S., Gr.2), Conflight, Hosting, Mighty Like, Miss it and a Bit, SP Player One and of Good Host, Hong Kong Captain, Anfitriona, Host of the Party, Count Montagu, Go for It, Inn Keeper, La Chica Bella, No Money No Honey, Livermore, Thors Bolt, House of Stars, Marli Magic, Social Set, etc. Alabama Man (g. by Americain). Winner at 2250m in 2017-18 in Aust. Panderelle. 7 wins from 1000m to 1600m, A$115,930, AJC PJ Bell Country Championship H., 2d STC Rosehill Gardens Event Centre 2YO H., 3d AJC Revesby H.
Pooties. 5 wins. See above. Marjessie. 6 wins from 1400m to 2200m, A$107,491, to 2017-18 in Aust. Be Unique. 5 wins from 1150m to 1800m in Aust. Canny Koru. Winner at 1200m in Aust. Our Chanel. Placed in Aust. Lord Dalmar (Seventh Hussar). 8 wins from 1400m to 2450m, A$116,050, QTC Gold for Australia H., VATC Malakoff H., BATC Courier Classified H., QTC Ngawyni H., 2d QTC Bracken Ridge H., J Cadell Garrick H., VATC Flinders H., 3d Ipswich Cup, Gr.3, Toowoomba Cup, L, QTC Easter Cup, L, Tails H., Panorama H., VATC Vice Chancellors H.
Rave Report. 3 wins to 1400m, AJC Just Topic H., STC Oattley H., Taylor Thomas Whitting H., 2d AJC CJ Dennis H., Col Crawford H. Sire. Luck's Avon. 2 wins at 1600m, 2050m, BATC Queensland Bloodstock H., 3d BATC Orlando Wines H.
Dalwina. Winner at 1800m, 3d TTC Rocherlea Tavern H., Hallams Waterfront Restaurant H. Producer. Bello Donna. Winner. See above. Daileon (Devorant). 8 wins from 1400m to 2100m, TTC TA Bricknell H., 3d Tasmanian S., L.
Canny's Girl. 4 wins-1 at 2-from 1200m to 1650m, BTC RSL Care War Veterans Home 2YO H. Producer. Aria Quest (West Quest). 6 wins from 1200m to 1800m, TRC Orford Blue Waters H., Polyflor Australia H., Book Now for AAMI Hobart Cup P., 2d TRC Ray Thompson H., TTC Racehorse Owners Association H., Sunday Examiner Magazine H., 3d Tasmanian Guineas, L, TRC Raine & Horne H., Thetote.com.au H., 4th TRC Hobart Guineas, L.
SMALL MINDS (Canny Lad). 4 wins-1 at 2-from 1250m to 2000m, A$334,795, SAJC Schweppes Oaks, Gr.1, Adelaide Guineas, L, STC Canterbury Park Event Centre 2YO H., 2d MVRC Dr Sheahan P.H., 3d MVRC Clayton RSL H., 4th STC Vinery Stud S., Gr.1, ATC Epona S., L. Producer. MARWIN GOLD (Marwina). 20 wins to 1200m, A$638,113, AJC June S., L, Moet & Chandon P., Campbelltown City Welter H., MRC Gippsland Sprint Series Final, LU Simon Builders Sprint H., Legacy Annual Appeal H., MVRC Austereo H., VRC Cleandomain H., AJC Smith & Nephew Genesis II P., William Inglis & Son H., Moraitis Fresh Packaging H., Frenmore Food Distributors H., MRC Textile H., 2d Gosford RC Pacesetter S., L, MRC Charles Trescowthick H., Carnival Club Welter H., MVRC Omega Smeg H., STC St Marys Leagues Club Welter H., AJC Avenium Flying Welter H., STC Perrier H., Slade Bloodstock H., 3d Mornington RC Hareeba S., L, QTC Dr John Power H., L, MVRC Lloyd Bendall H., NSW Tatt's RC Carrington S., AJC Toi Port H., Coralie Welter H., MRC Zephyr Bay H., 4th AJC June S., L, Gosford RC Pacesetter S., L.
Lady Dalmary. Winner. See above.